The International City/County Management Association (ICMA) recently released a report on a survey they conducted of local government sustainability practices. They found only 31.5 percent of responding cities have a sustainability plan. They also found that even among those cities with a plan, 58.6 percent had little to no citizen participation in preparing those plans. Those cities that did not have a plan responded that a lack of community support was one of the reasons they did not have one. The involvement of the community in developing a sustainable plan for the city is a critical element in gaining support. It is also a pooling of information from which city leaders can gain important insights. The larger percentage of responding cities in the ICMA survey that did not involve the citizens in developing those plans indicates that a majority of these cities do not see the value to doing so or they consider the costs to outweigh the benefits. These are interesting findings, especially since the recognition of the benefits of citizen participation in academic scholarship has moved beyond simply involving them in the discussion and therefore getting their blessings, but actually utilizing them to improve the overall plan. In a 2015 article published in Environmental Science & Policy, the authors note that technology in public participation has been an increasingly important research focus. This technology has facilitated the creation of citizen observatories in which citizens observe the environment and collect measurements. These are then shared with city officials who utilize the data to improve the planning process. This would involve data collection and provision, feedback and knowledge exchanges and direct involvement in decisionmaking by the citizens. 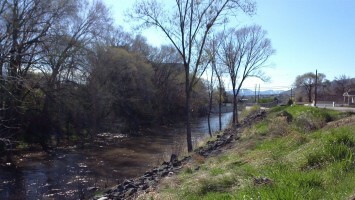 In the City of Pocatello, where my university is located, there is an ongoing planning process to redevelop the Portneuf River, which flows through the city. The river flooded in 1962 and 1963. This led the community to approve installing levees and concrete channels to control the river. The effect has led to the river being practically invisible in the city. The goal of the new plan is to restore the river corridor by improving flood risk management, restoring the ecosystem, extending the Greenway trails, granting public access to the river, increasing river recreation and connecting economic and neighborhood resources to the river. Essentially, the city has recognized the potential economic benefit the river could have and would like to tap into this resource. As the ICMA survey revealed, most of these sustainability plans are encouraged through the potential for development. The city has engaged residents in the plan by gathering input from them on visual preferences, the challenges and opportunities through the proposed plan, the development of goals and recommendations, a listing of projects and the prioritization of those projects. A number of citizens, volunteers and experts have been involved in the plan while their level of impact is mostly through a communicative influence. It appears that the citizens have been expressing preferences and even providing some data. The process is still largely low-tech. They are not using citizen observatories through explicit data collection via sensors, but using some implicit data collection through different means. It might be beneficial for the City of Pocatello and other cities to rely on citizen observatories and connect them to important technology like GIS for ‘citizen-led sustainability’ plans. This would involve data-centric forms of government that, along with more citizen involvement, are becoming more important in resource management. The era of ‘big data’ has found an intersection with citizen participation as citizens actually contribute through gathering data with city-supplied tools. The practicality of this move, both in the field and in the research, indicates that the concept of the citizen as simply passive in the planning and implementation process is outdated and present-day best practices are encouraging this form of governance. Author: Dr. Hummel is an assistant professor in the department of political science at Idaho State University. He is also the MPA Director. He teaches classes on state and local government, community planning, public budgeting and finance and intergovernmental relations. One of his research interests is urban resiliency. Email: [email protected].